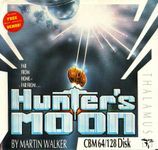 Hunter's Moon is Thalamus' fourth game for the Commodore 64, and is designed and programmed by Martin Walker, who also made the music. Hunter's Moon is a 360° shooter, where the players steers a ship, trying to find the stage exit by collecting stardust fields. Many of the stages includes puzzle-solving.